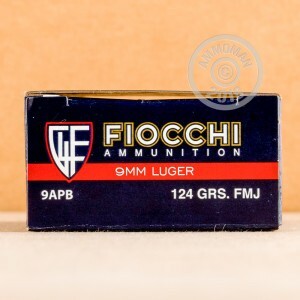 9mm Ammo - 1000 Rounds of Bulk Fiocchi 124gr 9mm FMJ ammunition from AmmoMan - Free shipping on bulk ammo! Available here in a 1,000 round case (20 boxes with 50 rounds in each box) for high volume practice, this load uses a 124 grain full metal jacket bullet. 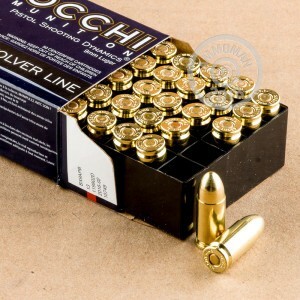 Fiocchi ammo uses non-corrosive Boxer primers and brass cases. To help keep shipping costs down, Fiocchi produces most of its ammo for the US market in Ozark, Missouri. I've lways been partial To Fiocchi. Fiocchi has always been loaded on the hot side and I've always found it to be very accurate as well. Showed up before the weekend! Always a plus. Well packaged, and good looking ammo. I'll circle back and post a performance report after my next 9mm match. Thank You AmmoMan.com - Prices are good with shipping included, and product has been consistently good over the past 10 years!